Desert Morada is our newest property and is one of 12 garden duplexes situated around a refreshing pool. All units have fenced back yards, washers and dryers, wifi internet and cable TV. House F is newly renovated with two bedrooms and one full bath with tub. Each bedroom has a king size bed. Plenty of natural sunlight comes through the new windows. The fenced rear yard looks out on to mesquite trees and desert landscaping. Secure, paved off street parking on a quiet street. Carefully furnished, all new kitchens and baths! New wood tile flooring throughout. 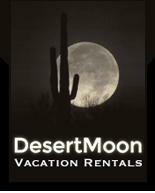 Conveniently located, ten minute drive to the Tucson Mall and great restaurants. Not far from the University of Arizona and area hospitals.